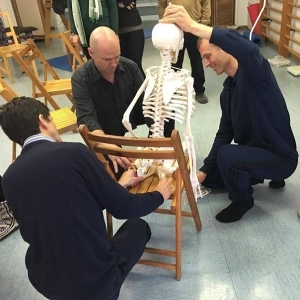 Our colleagues at the Wiener Ausbildungzentrum für Alexandertechnik are organising a workshop ‘Current Science and Alexander Technique’ with Dr Patrick Johnson and Dr Tim Cacciatore in May in Vienna, which we would like to recommend to all Alexander Technique teachers and trainees. A PDF poster can be downloaded from G.A.T.OE. (Gesellschaft für Alexander-Technik Österreich). The goal of these workshops is to confront our current relationship with science and to get our scientific explanations and concepts up-to-date. We combine lectures, group activities, and discussion to identify and debunk misconceptions and to build new, current models that support what we do and how we communicate. We emphasize rigor, jargon-free communication, and reference to current experiments. Specific topics will include postural control, sensory appreciation, body schema, stress, biomechanics of procedures, emotions, inhibition, and direction. Activities will include body illusions, experiencing body schema in action, inhibition tests, and plenty of break out discussion groups. We will also be debunking outdated concepts such as tonic neck reflexes, righting reflexes, ingrained startle pattern, tensegrity, and natural movement. We have been giving these workshops for three years now, live and via webinars, in Ireland, Spain, England, Israel, The Netherlands, Brazil, Argentina, Mexico, and the USA for both AT teachers and teachers in training. Our initial goal was to communicate rigorous science of Alexander Technique in ways that are accessible and fun. The workshops have since grown in both content and scope. They are now part of a broader dialogue about how to think objectively, scientifically, and professionally about what we do. We are excited about the enthusiasm and content they have generated. Dr. Johnson is a PhD. physicist and a practicing STAT/NeVLAT certified teacher of the Alexander technique with over 15 years of research experience and 8 years of AT teaching experience. Dr. Cacciatore is a PhD. Neuroscientist and STAT certified teacher, author of many peer reviewed scientific articles on Alexander technique, with 20 years of research experience. Next Next post: Move more easily, live more serenely!